Now that ‘Victoria’ has finished screening on ITV we can share our photos and videos of the filming. Back in May the volunteers were informed that the replica of George Stephenson’s Planet, built at Manchester Museum of Science and Industry was to be stored over-night in the Railway Museum building at Nunckley Hill. 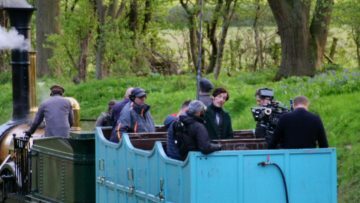 “Planet” was being used to film various railway scenes for a new Victorian drama, expected to be screened on ITV in the Autumn. The Mountsorrel branch line had been fitted out with a new platform, out of sight from Nunckley Hill and the local roads. Depending on how filming went we could expect to see “Planet” any time from 5 ’till 9. Having arrived at five, well it would a shame to miss it, we waited. In the far distance we could see smoke and steam from the train, but each time it appeared to be coming our way it stopped and turned back again. Obviously filming was still under-way. 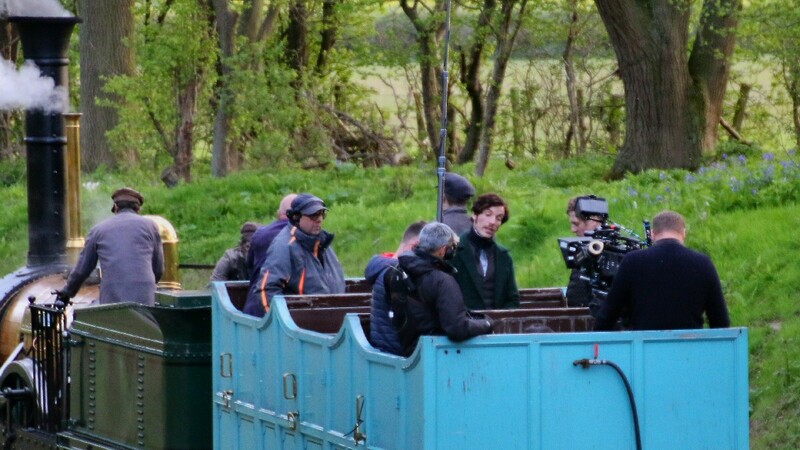 By six we were beginning to wonder if they would ever stop filming, when, to our surprise a carriage appeared around the bend, complete with film crew and actors; we were only expecting “Planet”! It steamed past the picnic area with a surprising turn of speed. (In the 1830s the original Planet could complete the 50km run from Liverpool to Manchester in just one hour). A few instructions from the train to move back to Nunckley Hill and it was off. Twenty minutes later up they came again, before disappearing into the distance once more. And again, and again. By 7:30 it was getting quite dark, surely they can’t film in this light? Too true. “Planet” finally arrives sans film crew and actors. Carefully put to bed, “Planet” is slowly reversed into the Railway Museum for a well deserved rest. Don’t forget the 22nd and 23rd October will be your last opportunity to take a train along the line this year. Tickets can be purchased in advance from the GCR, or cash only on the day.